Long or short-term monitoring: Mount the detector in spaces that are of concern to your team; receive alerts, investigate and ensure a smoke free environment 24/7. Monitors can be moved as needed to address shorter-term situations such as recurring complaints. Silent Alerts: Set your alerts online to notify your team via text and/or email, this allows you to ‘catch’ violators in the act and address appropriately. Discourage smoking: Notifying the public and displaying signage of monitoring often lowers occurrences of smoking in non-smoking areas. Resolve disputes & enforce policies: Ongoing data gathering shows when and where smoking occured. This data helps back up enforcement of policies such as hotel charges for guest smoking in non-smoking rooms. 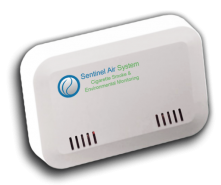 Customizable: Your monitoring can include additional sensors to monitor carbon monoxide, VOC’s or other needs to deliver the decision-making data your need. Adjustable: You have control of what time of day you receive alerts such as during business hours. You also have control of what level of smoke** particulate triggers alerts for facilities such as senior living facilities that may not allow candles or other flammables. Energy savings: All of our monitors include temperature and relative humidity monitoring. Tracking these allow you to see when energy saving opportunities exist throughout your facilities! Aretas will work with you to create a program to address your particular needs, call us today for a free online demo and to get your questions answered (877) 218-6232. Flexibility to monitor every room, unit or even hallways to ID when and where smoking is happening. Allows facility staff to address guest smoking in-person after receiving a text and/or email alert. Your data is also archived online allowing additional support if you need to enforce non-smoking policy violations. These facilities often have issues with guest ‘sneaking’ a cigarette or even lighting candles which are often prohibited due to fire hazard. Installing monitors in areas where complaints are made can help identify and address issues quickly and quietly. The Aretas team is continually working to lower costs for all solutions. Currently, a cheap off-the-shelf cigarette smoke detector at your local Lowe’s or Home Depot is not available. 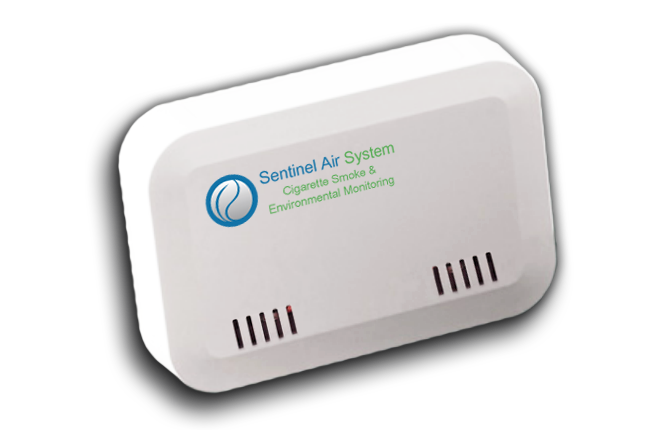 Our smoke detection and monitoring system is the lowest-cost, data driven solution that monitors your facilities and helps you make decisions anytime, day or night. Call or email us today and a live representative will share options and quote a system to meet your specific needs whether that is one or 50 monitors! At no additional charge our monitoring solutions include temperature and humidity monitoring to determine if energy savings opportunities exist allowing you to offset the cost of PM and other monitoring needs.